When you’re hungry, nothing quite hits the spot like a juicy, crisped pork tenderloin, which is probably why this superb cut of meat is the state food of Indiana and a favorite of Indianapolis residents. Here are a few of the best restaurants to visit in Indianapolis the next time you get a hankering for delicious pork dishes. If you’re looking for a top-notch Indianapolis restaurant where you can chow down on pork tenderloin, look no further than Aristocrat Pub & Restaurant. Since 1933, this restaurant has been serving up tasty pork tenderloin to the delight of Indianapolis residents, and their menu also offers a wide range of other delectable items that you’ll want to try for yourself. To sample the pork tenderloin at Aristocrat Pub, order the wiener schnitzel, which includes a 6-ounce center cut piece of pork tenderloin that’s breaded and fried to a golden-brown color. The dish also includes plenty of great side items, including red cabbage and German potatoes. Want a pork tenderloin you can pick up and eat with your hands? Order The Hoosier tenderloin sandwich, which includes a center cut of pork loin that you can have either grilled or fried. Visiting The Rathskeller is a great choice if you want to enjoy a pork tenderloin dinner in a vibrant atmosphere. Designed after a classic German beer hall, The Rathskeller allows you to enjoy the charm of the Old World right in the heart of modern Indianapolis, and they also serve some of the best food you’ve ever tasted. The grilled pork tenderloin is one of the most popular menu items at this restaurant. Order this dish, and you’ll savor the lean medallions of pork loin, which you can smother in either tangy teriyaki barbecue sauce or spicy Dijon horseradish. Make sure to complement your dinner with one of the icy-cold beers that The Rathskeller keeps on tap. While it’s mostly known as a seafood restaurant, Rick’s Cafe Boatyard is also one of the best spots in Indianapolis to visit when you need to satisfy a pork tenderloin craving. There’s nothing quite like digging into your pork tenderloin meal while you take in the sunset over the Eagle Creek Reservoir and listen to some smooth jazz. At Rick’s, you can enjoy a juicy cut of pork tenderloin that’s wood-grilled and seasoned using a secret house blend that results in a one-of-a-kind flavor. The meal comes with a side of crispy Southern fried chips to make sure you’re fully satisfied. Try their pork tenderloin once and Rick’s Cafe Boatyard is guaranteed to become your go-to spot whenever you’re in the mood for this Indiana staple. 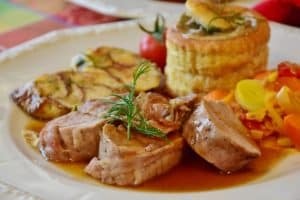 If you’re an Indiana native, then you’ve probably eaten pork tenderloin for most of your life, but this doesn’t mean that you still can’t be wowed in the different ways to prepare this timeless dish. The next time you’re in the mood for a pork tenderloin dinner, be sure to grab a table at one of these Indianapolis restaurants and enjoy a delicious meal.